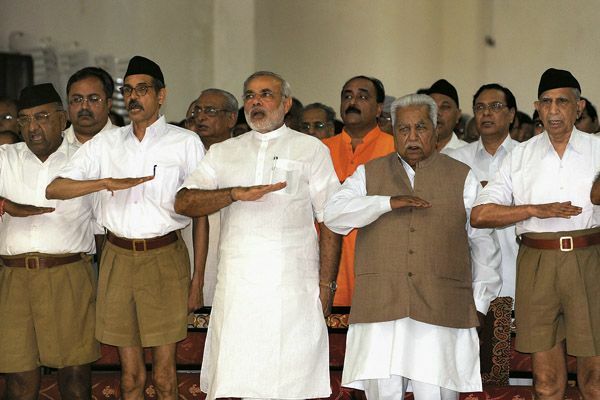 The rise of the Sangh Parivar and with it the BJP in its present form from the 1980s had initially led to a debate among the liberal intelligentsia as to whether they could be characterised as ‘fascist’. The BJP along with the other constituents of the Sangh Parivar in little more than a decade, from the demolition of the Babri Masjid to the Gujarat pogrom, resolved that question. On a more serious note, the debate within the Left about the nature of fascism in India led to a wide spectrum of writings. One strand was based on either a political critique [ii]aimed at exposing the project of Hindutva in its pristine form as envisioned by Savarkar in 1923 and later by Golwalkar in 1939 or by tracing the history of the Sangh Parivar from its precursors to present times. The other strand was based on political economy interpretations of European fascism of the 1920s and 1930s and comparisons with the trajectory of the RSS led formation and expansion of the Sangh Parivar. The two strands of scholarship overlapped and together formed the basis of the political debate that was vital to the emergence of a progressive praxis of wide alliance with all anti-communal forces against the BJP – a strategy that had worked periodically in terms of checking its meteoric rise but broke down under the contradictions of neoliberalism. 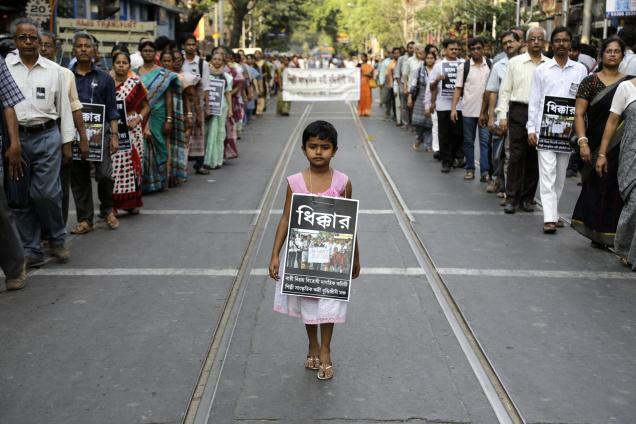 Society in West Bengal has taken a distinctly violent turn. Within the wider sphere of rising violence, what is the character of sexual violence we are witnessing everyday? It is being propelled, as all evidence suggests, by a strong misogynist political current, informed by patriarchal and propertied social and economic interests. Europe has been in doldrums since the financial crisis of 2008 and various degrees and shades of recovery, bailouts and assault of austerity drives have meant the continent turning into a major cause of concern for the stability of global financial order. The economic troubles have naturally meant radical effects in political, social sphere across the continent and from Greece to Portugal and Spain; the underbelly of Europe is suddenly rising in revolt. While it is interesting to track the fortunes and trails of emerging progressive alternatives in Europe in general; it is more necessary to place these alternatives in the broader context of unprecedented might of finance capital. Only such historical, dialectic view will help sober the unprecedented and sometimes unreasonable expectations from the emerging alternatives and understand the gravity of the situation better. 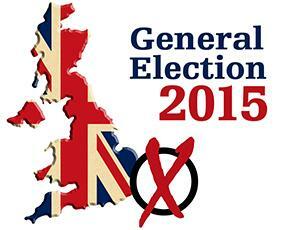 It is in this context that the assessment of UK elections results assumes critical importance. Amidst the attempt to rewrite the history of the Second World War, the world is celebrating the 70th anniversary of the Soviet Union’s Victory over Nazi Germany this year. It was on May 9th 1945 when the Soviet Red Army took control over Berlin; the capital of Nazi Germany. This event has been decisive in shaping world history in more than one way. This victory sealed the fate of fascism and established the Soviet Union as one of the greatest powers in international politics. 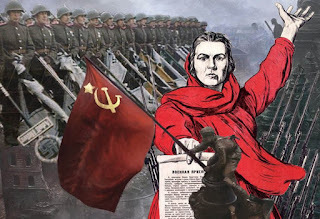 The exclusive claims over the legacy of democracy and protection of humanity put forward by the liberal world, their attempts to vilify socialism as an undemocratic ideology were discredited by the narrations of sacrifices made by the world’s first socialist nation and its people during the war. Perhaps this is the reason that even after 25 years after the fall of the Soviet Union, many nations are unwilling to acknowledge the facts and are trying to manipulate them. This attempt is accelerated due to the re-emergence of fascism in Ukraine and other parts of the world including in our own country.